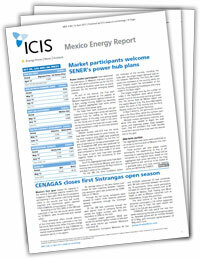 The ICIS Mexico Energy Report (MER) is the leading English language information source for Mexico’s emerging energy market. The report provides news, commentary, analysis, data and prices for the Mexican power and gas markets, which have become the most exciting domestic energy markets in the Americas. The MER is a weekly publication that provides in-depth coverage of the latest regulatory, project and market updates for this rapidly changing market, as well as the latest pricing information reported by market participants. The report is essential for companies currently active or looking to engage with the energy trading opportunities emerging from Mexico and across southern US. James Fowler has led ICIS’ coverage of Latin American energy markets since 2012. He has more than nine years’ experience covering Latin American energy matters for a range of different publications, including Business News Americas and the Economist Intelligence Unit. Since 2015, he has focused primarily on Mexico, first as the editor of the ICIS Mexico Energy Report, which remains the flagship English language report focused exclusively on Mexico’s natural gas and power markets. The role allowed him to be involved in the Mexican energy reforms since inception by covering the design of both the gas and power markets. Through the report, he was also able to publish the first OTC pricing indications for the power and clean energy certificate markets. In his new role as Senior Energy Analyst in the Americas, his focus is on developing in-depth information and analysis products for Mexico and the wider Latin America region. Claudia Espinosa is the editor of the ICIS Mexico Energy Report. She joined ICIS in 2017 and has covered Mexico and the Americas. Previously, Claudia consulted on Latin American political and economic issues for organizations in the US and Mexico. She holds a bachelor of arts degree and a master’s degree in international affairs focused on Latin American politics and business management. How could Mexico’s natural gas market evolve in 2019 as the new administration of its leftist president begins to form its own energy policy? 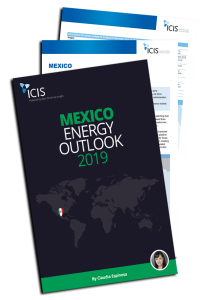 Find out in this ICIS Energy Outlook the roles infrastructure, economics and policy will play in the ongoing evolution of Mexico’s natural gas market! To read more about the effects the new administration will have on the market, download the outlook by market expert Claudia Espinosa.